One thing I'm looking forward to with the finished basement is getting everything organized. I can't wait to use up all the storage space and put all our things in their proper homes. 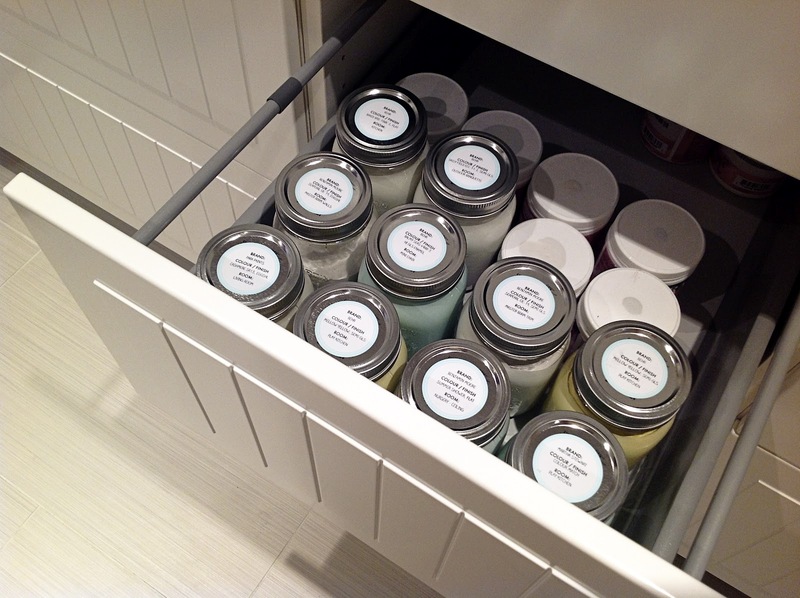 We've managed to get some of the laundry room cabinetry in place and I was so excited to put something - anything - away in the new drawers. Pretty sad, huh? Looking around our messy basement, I knew what I would tackle: the paint cans. 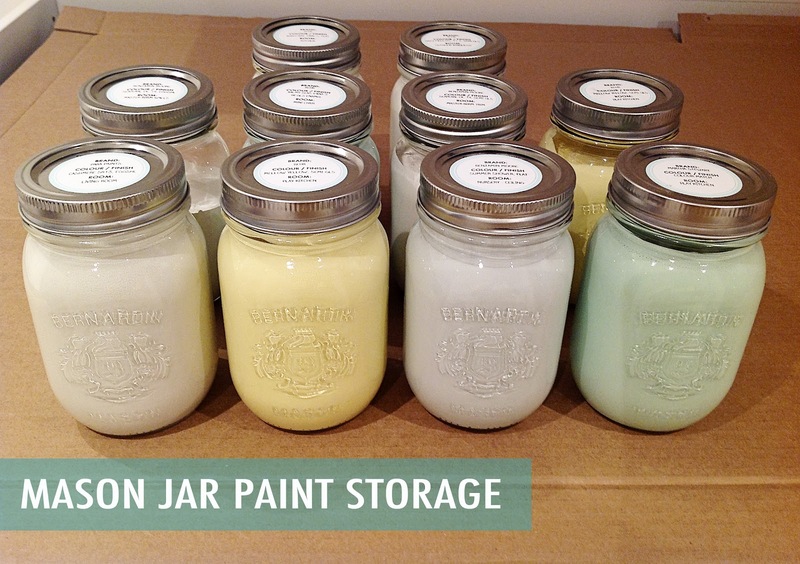 We have so many gallons of leftover paint kicking around, taking up valuable space. 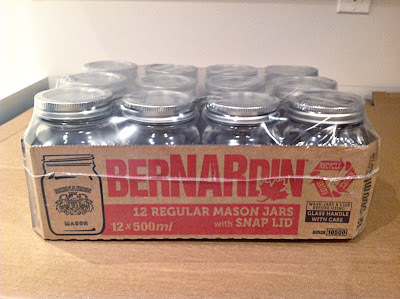 Walking around the store yesterday, I saw all the mason jars for sale (its canning season!) and knew I could use them for a pretty & simple paint storage solution. 1. Buy some mason jars. These were 12 x 500ml for $7. 2. Get some labels. I used these Martha Stewart ones from Staples. 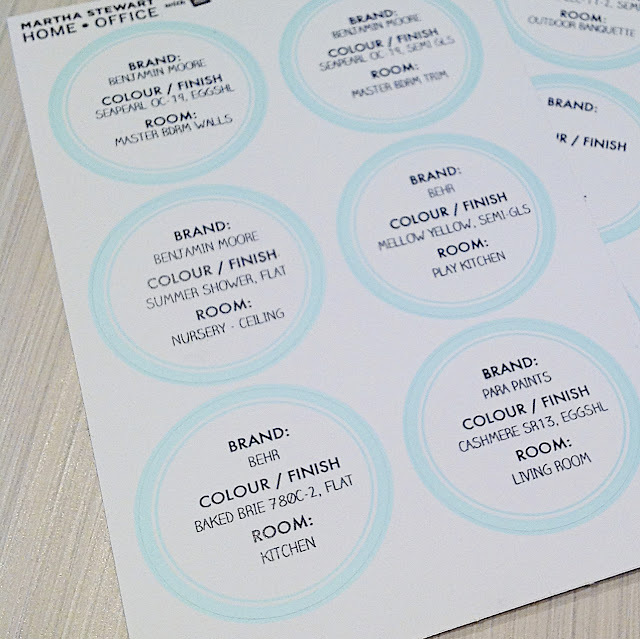 Copy the info from your paint cans and type up your labels. You can also go old school and write on the jar top using a marker. 3. Open up your paint cans and stir them to even out the colour. TIP: Use a metal whisk instead of a wooden stir stick. The paint washes off the whisk really easily with a bit of water, and you can reuse it for all your different paint colours. 4. Pour your paint into the mason jars. Screw on the tops. Stand back and admire the prettiness. That was fun and so easy! What can I organize next?? Um, this is a genius project! Totally have to do it too! This is perfect! We have a gazillion paint cans kicking around in the damp basement too - this is something I could definitely convince myself to tackle in all this heat. Hi Dorelle. I did have the smearing problem when I printed the label in red ink, but I switched to black ink and it worked fine. I also changed the font to something not too swirly. Sorry, I don't have the file anymore but I think the larger font I used was Futura. Me again last post on this I promise...Staples said they do not print on anything but 8 x 11 sheets and their own paper for laser ... so if you don't mind telling me the brand of printer you printed these on I can search for one. Canon rep told me their ink is probably not compatible with these labels. How pretty. Martha would be proud of those labels being used so creatively. That would be great for touch up paint! Good point. I had two cans of custom colors (paint I had colour matched into a different brand). I couldn't fit the recipes on the label so I took a photo of the recipe. Not as effective but chances are slim I'll need the recipe any way. One thing about paint in mason jars that I have learnt (the hard way) is that they break if you drop them. They do look so pretty in the jars. I did the same thing at our last house! Made things so easy! I also put a layer of Saran or cling wrap over the top of the jar before adding the lid. It keeps the lid clean since there's two pieces and I never had issues with the metal corroding. Question though...It looked from the photo like you had almost a full gallon of paint - did you make a few jars of that one colour or did you take the 500mL and then take the rest to a recycling centre? Just curious. Stirring paint with a whisk? Genius! Such a great idea, thanks for the tip! Love this idea! I was actually just thinking of doing something similar.. thanks for the inspiration! This is such a great idea. And so pretty, too. I was thinking about trying something similar with trim paint and a foam brush. I saw down thing about it online a while ago and thought it was brilliant. I always see little spots to touch up and that would be quick and easy, plus the brush shouldn't dry out if the lid's on tight. Anyhow, you are inspiring me to do something about all the paint. Gorgeous - that has to be the most beautiful paint drawer ever (well next to Martha's). I would have added one more thing to the label, the colour 'recipe' that tells the paint people how much of whatever colour to mix together. I recently wanted to get more paint to match an old project. I brought the remnants of the old paint to Home Hardware only to learn that the line of colours was discontinued. They would have had a difficult time matching by name and brand, but the lid had the recipe and they made me up a matching batch based on that.